It was a team of crazy BBC. I was one of the newest entrant to the group, who started the first ride as a part of the group in the month end of April 2010 to Nandi Hill. I did manage to reach the peak and but failed to reach home by about 10 to 15 Kms and had to catch an auto. Well, I managed it the next time very comfortably, that in spite of pretty bad head wind on return... that was in July end where about 150 people rode to the same destination at the same time. Though I had done three century rides by this time, I wanted to try a tripple century in a single day. Since I myself was not sure, I thought I would go to some popular place where return would get other options if I break down on the way.... chose Mysore... pestered big guys in BBC like Yogesh to initiate one for Mysore. August 28th was planned. 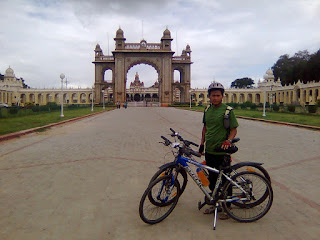 I enrolled for the 300 Km in a single day category as there were various other categories. I had a bus ticket on that night to Coimbatore at 23:00. So, I had to be home by 10pm at the latest. Thankfully other big guys in BBC like Siddu and ShreeHarsha were also planning to do 300 in a single day and they did most of the planning to keep the time. I started at 0330 in the morning. Going was easy as it was downslope. I reached Kanakapura in no time, hardly before morning, it must have been about 60 Km... in less than 2 and a half hours. We had breakfast, we were about 7 people in the same place for either coffee or idli. From there, I has behind most other guys. I wanted to go at my own pace (do I have a choice? ;)) It was getting tougher and tougher towards Mysore as the slope increased and a little bit of headwind. Managed to reach Mysore palace by around 12:30. Took some snaps. Three of us were there at that time. Four already headed back to Bangalore. Siddu had his rear rim dented and so decided to go back by bus after his Chamundishwari ride. I too decided to head back to Bangalore... alone as the other two guys decided to take Airavat bus. After riding about 15 Km, I thought I should rather take lunch else would miss my lunch. Spent too much time in the hotel for the lunch. Time to do some serious planning to reach home by 22:00 hrs. I also knew that the terrain from Rajarajeshwari Nagar towards Outer Ring road and towards JP Nagar are terrific ups and downs and I would take some energy there. So, I planned in such a way that last 60 Km should have at least 5 hours. To achieve that I had to average above 20Kmph for the first 85 Km. Well, I managed easily as it was good down slopes. Stopped here and there for water, tender coconut and snacks. Before dark, I started seeing all the familiar places like Wonderla, Kamath hotel, etc. I was more charged now seeing the destination coming sooner. But the traffic became messier and messier. Road was muddy and wet. Finally, I hit outer ring road by around 20:00. As I expected, outer ring road literally killed my knees. Stopped for dinner along the outer ring road. I had a lot of oil-fried baji and bonda stuff and a vegetable fried rice. Then headed for home. I reached home a little past 21:30 hours. So, I have done solid 18 hours of riding including breaks. I had problem in my cyclo-computer in Kanakapura and I had to reset everything. But Mysore to Banglore showed 145 (till home near Dairy Circle), in 8:12:00 (stopped the clock during lunch alone) in an average of 18.x Kmph. So, I managed to catch my night bus to Coimbatore comfortably and drive back my car from Coimbatore to Bangalore along with family the next day.